Jaeger-LeCoultre has proven time and again that it masters the “Art of Precision” to the smallest detail. 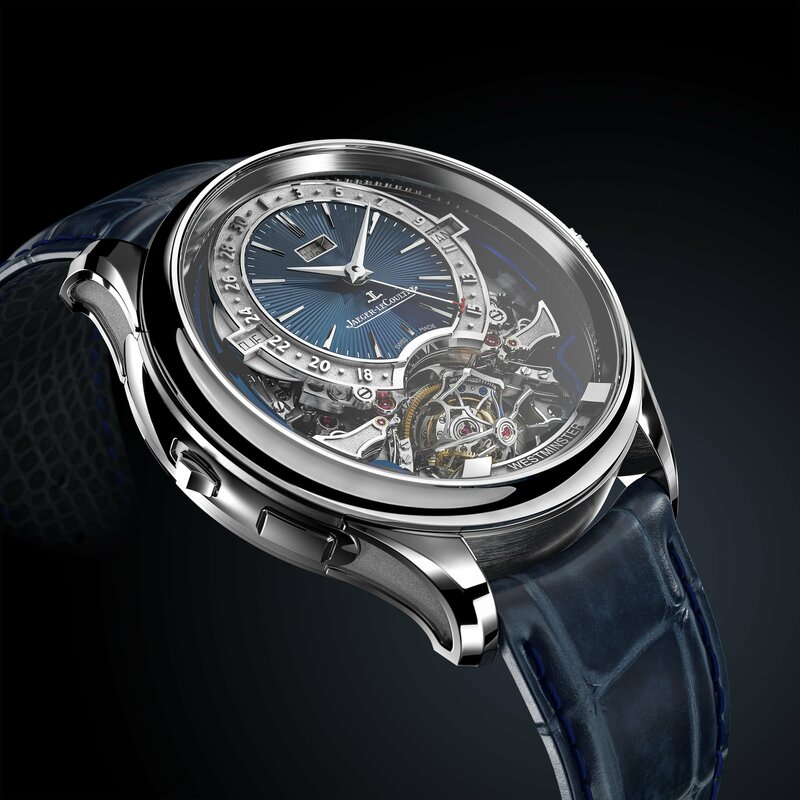 Its new Master Grande Tradition Gyrotourbillion Westminster Perpétuel is no exception: it is in fact the brand’s first multi-axis tourbillon with a constant-force mechanism, Westminster chime and perpetual calendar. Building on the success of its predecessors, the 2004 Master Gyrotourbillon 1, 2008 Reverso Gyrotourbillon 2, 2013 Master Grande Tradition Gyrotourbillon 3 Jubilee and 2016 Reverso Tribute Gyrotourbillon, the new timepiece boasts several particularities. The fifth multi-axis tourbillon underwent a size reduction in the redesigned tourbillon component, rendering the watch more easily wearable. A Westminster carillon minute repeater replicates the chime of the famed Big Ben clock tower in London, with a silence-reduction mechanism to optimise melody cadence, transporting the wearer to London in the space of a second. A one-minute constant-force mechanism provides consistent energy to the sensitive tourbillon, resulting in a precisely jumping minute hand and a more precise minute repeater mechanism, echoing the “Art of Precision”. A sleek new contemporary aesthetic pairs traditional haut-de-gamme finishing with a modern look. The Master Grande Tradition Gyrotourbillon Westminster Perpétuel constant-force mechanism highlights the precision of power delivery in one-minute cycles, the precision of time display in the jumping minutes hand and the precision of the repeater chime. 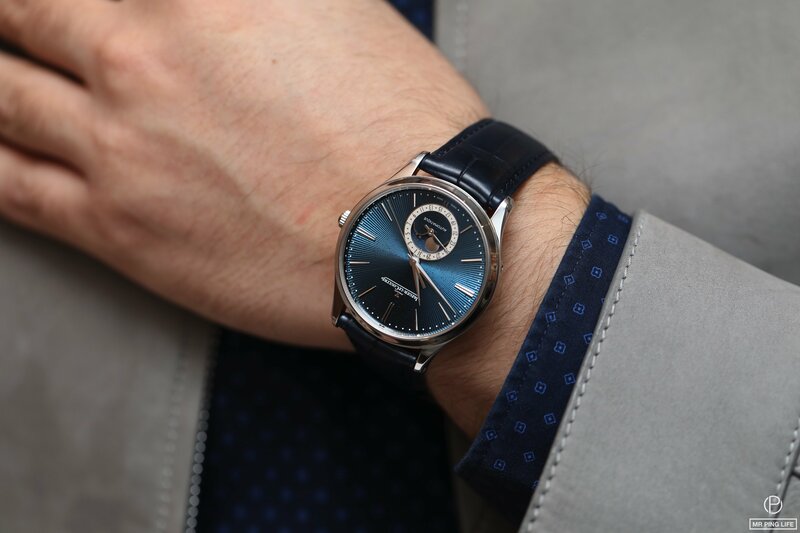 The Master Ultra Thin family grew at this year’s SIHH with three models featuring some of the most emblematic complications of watchmaking: tourbillon, date, perpetual calendar and moon phases. The brand’s “Art of Precision” shines with sophistication in these three new limited editions, in white gold and midnight blue enamel. The new Master Ultra Thin Tourbillon Enamel boasts a new tourbillon movement in the form of a light and graceful gold oscillating weight. 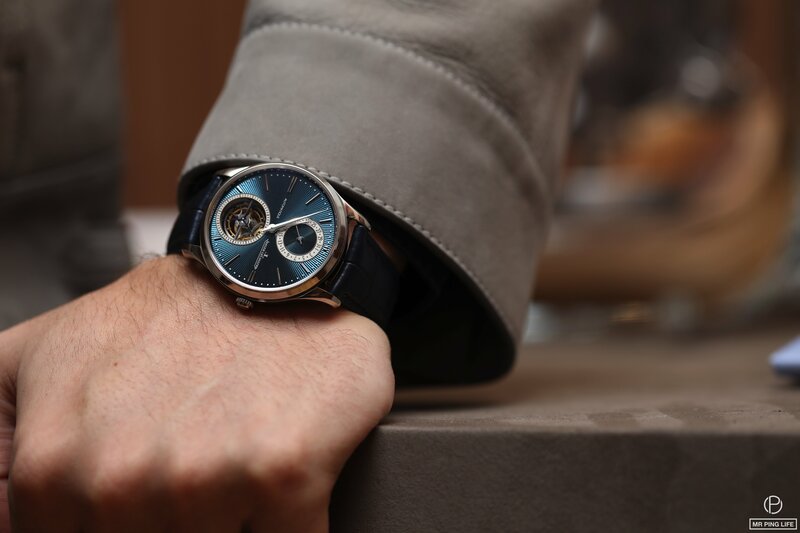 Mirroring it on the upper side of the hand-guilloché dial is a new-look date counter. Together, these 2 display circles form a balanced pair in an 8-like disposition, adding to the esthetic of the blue, sunray-effect enamel background. Produced in a limited series of 50 pieces, the watch comes in a 40mm white gold case. The Master Ultra Thin Perpetual Enamel goes a step further, and features four internal apertures on the blue enamel guillochéd dial, capturing immediate attention. 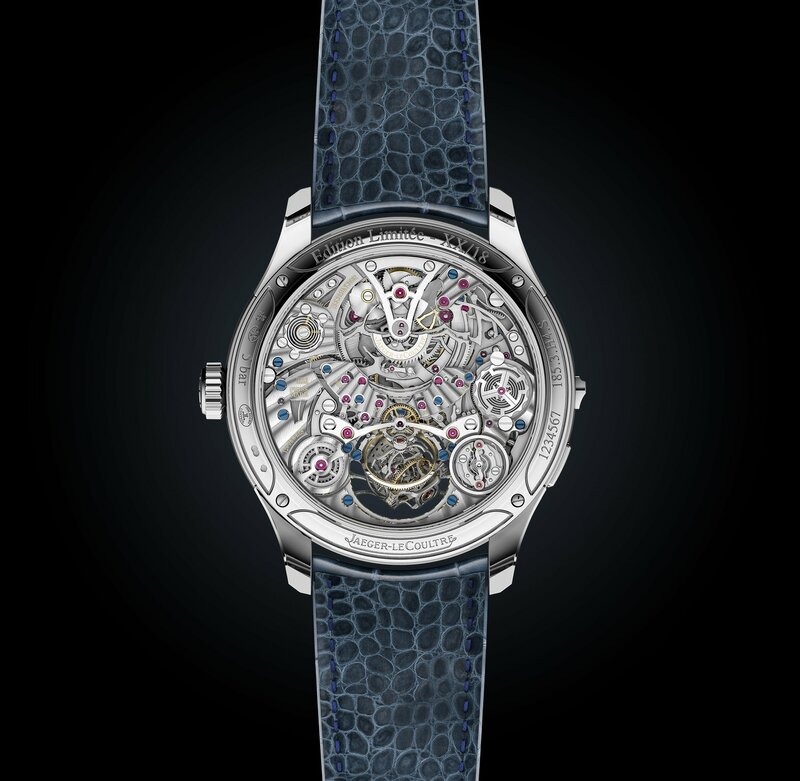 The famous JLC Caliber 868 has been redesigned for this ultra-thin, 100-pieces only limited edition. The new and sophisticated perpetual calendar display simultaneously indicates the moon in both the Northern and Southern hemispheres. Enhanced by a new design, including an eye-catching engraved counter, the moon phase sets itself in motion thanks to its different phases, waxing or waning.The watch is a perfect testimonial of the Maison’s “Métiers Rares®”. The purest in design out of the three new Master Ultra Thins, the Moon Enamel has a straightforward and simplistic character. 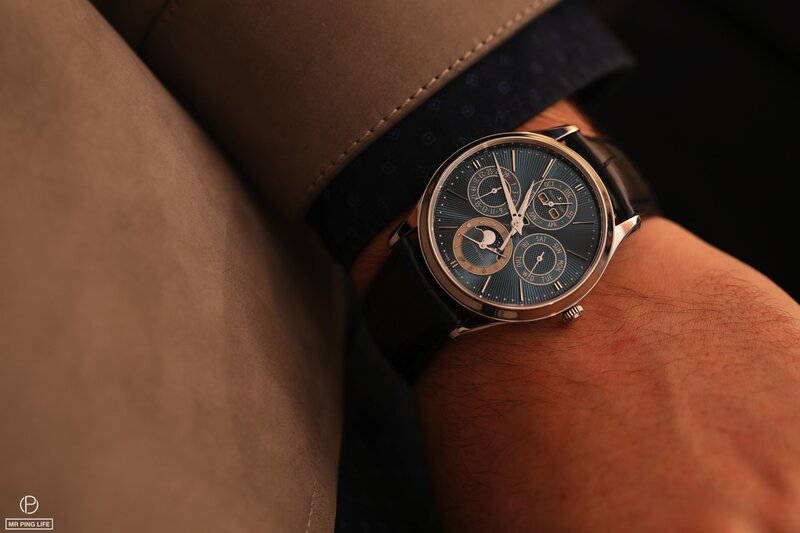 The different touches include a new hand-guilloché blue enamel dial, hour-markers, polished moon and engraved counter. Its extremely thin 10.04mm white gold case houses the automatic mechanical Jaeger-LeCoultre Caliber 925 with a 70hour power reserve. The expertise of the Jaeger-LeCoultre master watchmakers, artists and artisans in mechanical precision and artistic creativity is backed by these new limited edition pieces that complement the Master collection on both the esthetic and technical aspects.